Have you ever stenciled a basket? It’s a bit more difficult than using it on a flat surface but it’s looks great. Case in point, this fabulous Fortnum and Mason basket from London. It came like that. Doesn’t it look fabulously luxurious? I decided to try my hand at painting my own. I taped on the stencils first using masking tape. I found the stencils at Walmart I think. Then I used black acrylic paint. Pretty basic, right? I used a stencil brush, not a spray can. I bet you are wondering why I chose the number 38. I have to confess I am too. I have no idea why I chose that number. After the paint dried I removed the stencil. I put the basket on this French chair for awhile. Then I had it stacked with another basket by the stairs. It did better sitting flat than on its side, but the numbers were not showing. I didn’t want all of my hard work to be wasted. Then I moved it to the mountains and that’s where it is now. Well all’s well that ends well, right? Because I get asked for sources, I have begun to do some shopping for my readers on selected blog posts. I found some baskets I adore and I have included affiliate links to those products below. My giveaway is still going on for the rest of August. I already shipped this exact prize to the winner of my last giveaway. 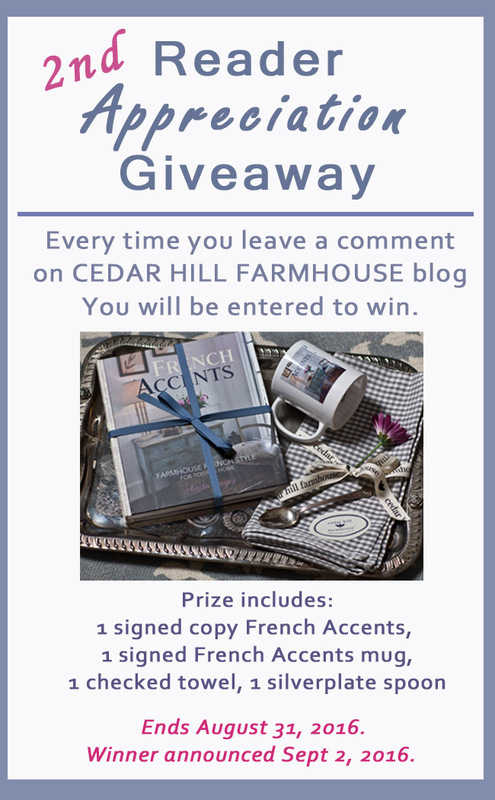 Every comment you leave on my blog enters you to win automatically. The details are here. 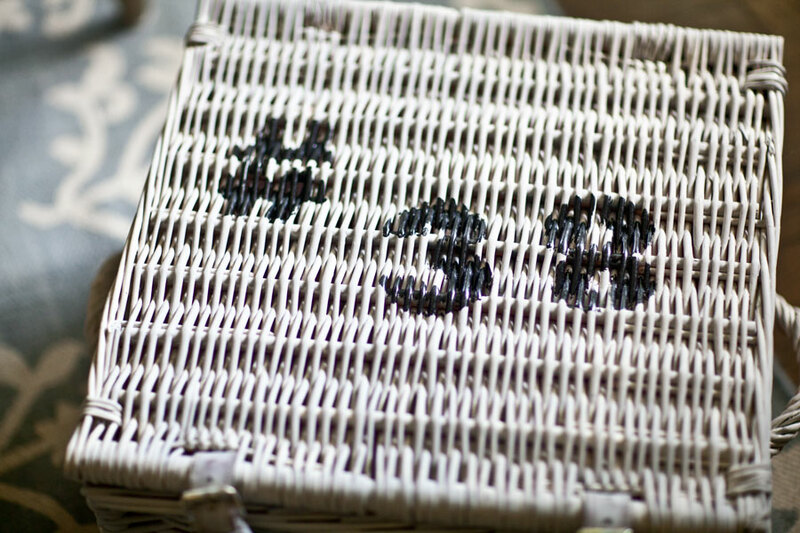 When you stenciled the number on the basket did you use a stencil brush or spray it on? Molly, yes it was a stencil brush. You can use spray, but you have to be careful of overspray. Nice idea. I wish I had more room to implement more of your ideas. As always you bring me lots of inspiration. What a great idea! Thanks for sharing your instructions. The Lidded rattan basket is currently on sale at Pottery Barn. They come in 4 different sizes. Thanks for the heads up! I’m crazy about baskets too, they add beautiful texture to the bright and airy, clean look I’m going for, the added storage is a huge bonus. I can’t wait to get a little creative with some stenciling, thanks for the inspiration and the sources! 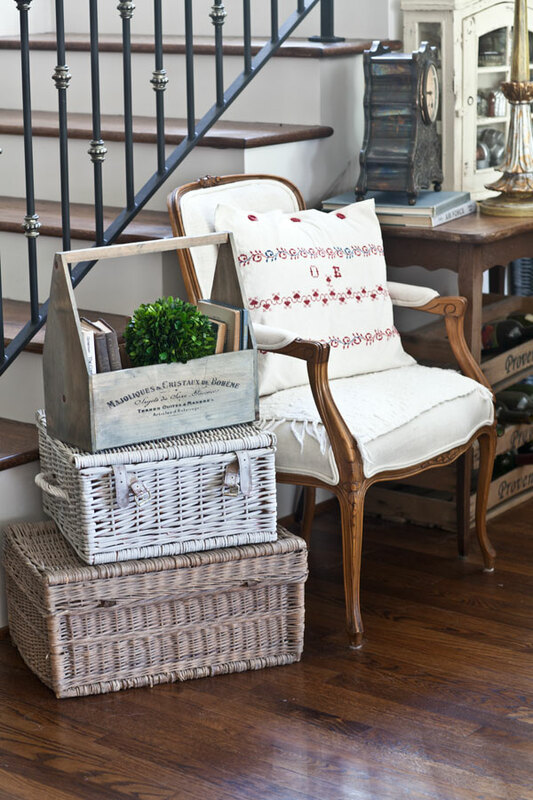 Love the lidded rattan baskets, and they’re on sale right now! Thanks Anita! Great post! On the vintage basket how do you know if the price is a good price!! I love the stencil on a basket. I must try this! Now I have the. Outrage to stencil a basket. Thanks! Do you have any sources for stencils with French Words on them? Jardin or other words that would be cute around the house? I would appreciate your input. Thanks for a nice blog! thegraphicsfairy.com has tons of free stencils, including many French types. Hope that helps. I love baskets. I sold two picnic baskets last weekend and am kicking myself. I look forward to fall when things slow a little for me and I can stain and paint some projects. Thanks for your inspiration. I love stenciled baskets, too! I will have to try it! I really love the look of the stencil on the baskets and I appreciate the instructions. I have a yen to give some of my antique picnic baskets this treatment, adding my initials. Thank you! Thanks for sharing your basket and stencil idea! Love your blog! I bought Country French magazine. I’m willing to pay more to get a magazine that is so beautifully done and that isn’t mostly ads. Congratulations on the article! I am anxious to try my hand at stenciling a basket because I love this look! Thanks for the idea! You’ve inspired me!!! I’m going to try this. I love your variety of baskets displayed in your home. Thanks for the ideas. I just clicked a link to your site and love your style. I think this is the beginning of a long and inspiring love affair with your style. So glad you have you here Phyllis! Welcome, welcome. Love wicker baskets! I have some antique picnic baskets and I might just try to stencil one next week. Thanks for a great idea! Love your posts! Have a great weekend! Oh my goodness!!!! I LOVE the baskets!!! Especially with the stencils! Thank you for the basket resources! You could duplicate the stenciling on the side of the basket so it would still be visible when it was stacked. Love it. As always, you have the best ideas! 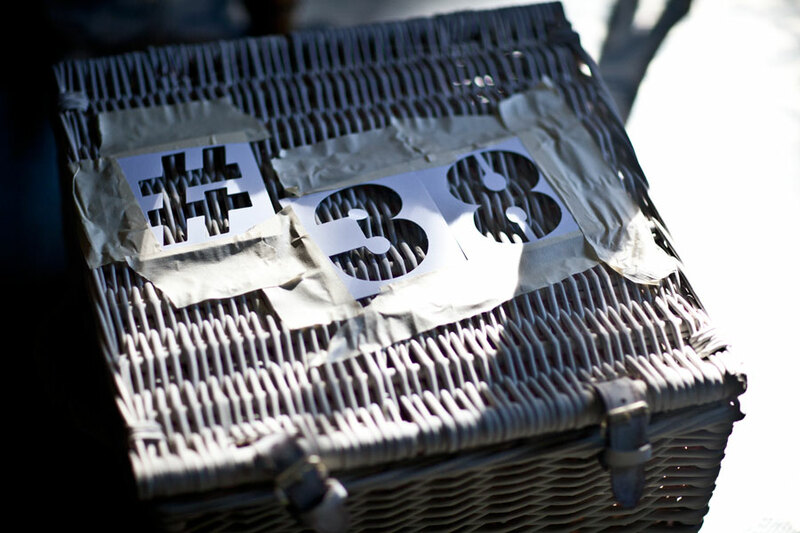 Looking forward to stenciling one of my existing baskets, maybe with my wedding year? Hmmm, that might be a great idea for doing a wedding or shower gift basket as well! It is easier than I thought to do this. 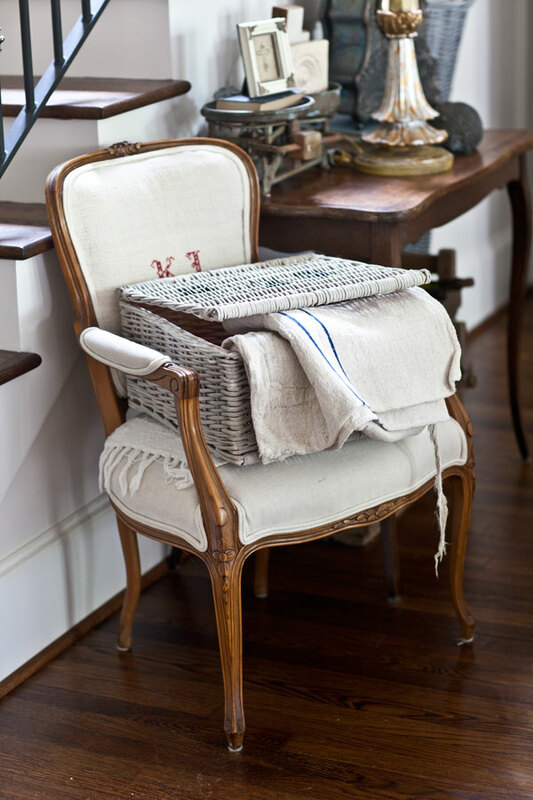 Love the Rattan basket and the idea from a reader to stencil on the side as well. Great idea on the stenciling, the baskets are gorgeous, I love baskets! Ooh…love the stenciled basket and the ones that you gave the links to. Thank you. And Inswoon the give away. 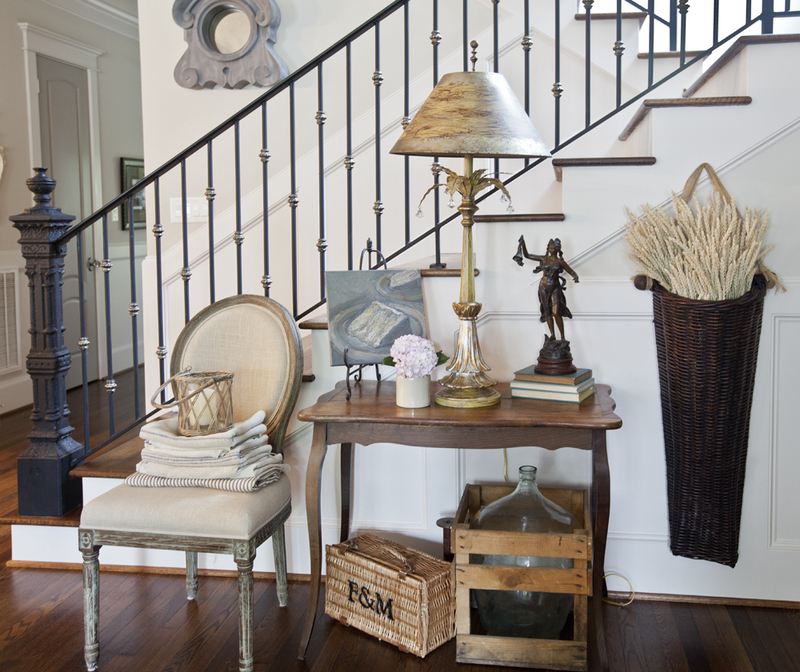 Love your decorating style……and love the stenciling baskets – never thought of that – but will be trying it. Thank you for sharing your talents. 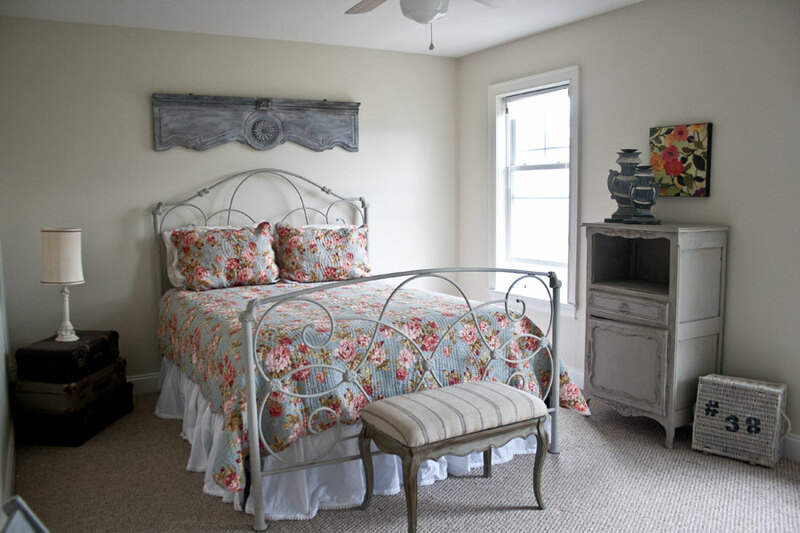 Would love to find a French lidded basket to use as a side table and storage! A wonderful idea to Stenio on a pretty basket! You are always an inspiration and sharing your struggles show how truly blessed you are. Thankyou for your transparency and inspiring your many thankful readers. I love this idea, thanks for sharing. You are very generous with your information. Love the basket but love the antique tool box even more! Need to find one and antique it along with stenciling. Thanks for all the great tips! Thank you for sharing the pictures of the baskets. I love them all! I like the stenciled basket. What a lovely idea. Your basket looks beautiful. Thanks for sharing. Love the baskets……with stenciled letters!! I remember this post and love your baskets, but how did I miss that darling wood tote??? Please, do tell, where did you find that little treasure? Ginger, I’ve had it for about 4 years or so. I can’t remember where exactly I got it, but I seriously doubt they still have it. I’m sorry!! Super cute ideas! I struggle with clutter-control and baskets have been a really helpful tool in this ongoing, never-ending battle! Those baskets are all so cute. Thanks so much for providing the links. I am off to gather supplies right now!!!! I love what you did with your basket! I am always collecting them and then wondering what to do with them. Now I know!!! !